It must be said. I am not a dog person. I was raised with cats from the time I was born so I understand cats and I get their stand-offish aloofness. However, when my son was four-years old, we rescued a dog from the shelter. 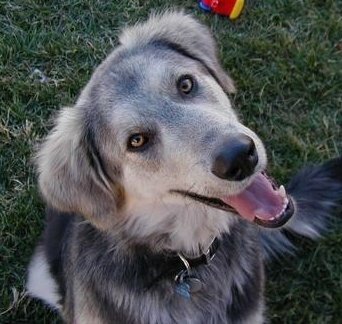 He was an Aussie/Golden mix and he looked a lot like the dog on this cover, but he was gray and he was huge, and his eyes were light gray, but apart from that the expression is the same. We had no idea what he had gotten ourselves into. My cat did (figures). Needless to say, it did not work out but we insisted on making it work and then the poor thing had a heart attack and passed away. Why do I tell you this? Well, because I really wanted to have the relationship with my dog that others had with theirs. Is it possible for a cat person to become a dog person? As I was reading the book. I began to yearn for a dog again. Enzo, is the dog of all dogs and the type that I would like. He is human-like and always thinking and it made me question if dogs, as a breed, are like this all the time. At first, I didn’t get the racing part. Car racing is not my thing, but as the story progressed, and Denny’s love of racing became Enzo’s love of racing, I began to like it more. I loved that the story was told from Enzo’s point of view. I loved the descriptive passages about the various scents piquing Enzo’s curiosity. Those sections seemed very genuine to me. As if that is exactly what a dog would think, given that particular situation. The loyalty that Enzo felt towards his family was very touching at times. I would have liked to have seen Eve’s character developed a tiny bit more and I could have done with a little less race talk, but the end brought it all together for me so I was satisfied with how it all worked out. It’s not a spoiler, since it’s mentioned in the synopsis that Enzo does eventually pass but when he does, his death is handled so well by Stein that I actually stopped breathing. When my beloved feline friend passed away after almost seventeen years, he died in exactly the same manner as what Stein described in the book. It gave me chills. Overall the book left me with a warm feeling and although it did bring back memories of my animal friends, they were all good memories and it was like taking a walk down memory lane. I decided to include of picture of the the dog that we had for only four months. He was just a puppy. His name was Mobley. I won this book in a Twitter contest that Jennifer over at Book Club Girl was hosting. Jennifer is hosting a Blog Talk Radio show with Garth Stein on July 22nd. For more information on the show, click here. I can’t wait! I am a dog person and I just adored this book. Enzo is a fantastic narrator. I'm bummed that I'll miss the BTR show, but I'll listen to it later. Don't know if I could handle this one, especially considering I bawled through Marley & Me. I've heard good things about it, though. I'm so glad you liked this book! When it first came out, my beloved Mandy (Aussie-Chow mix) had recently passed away and it was hard for me to read but I'm so glad I did. After awhile I got a kitty (Jax) and he rules my life now. 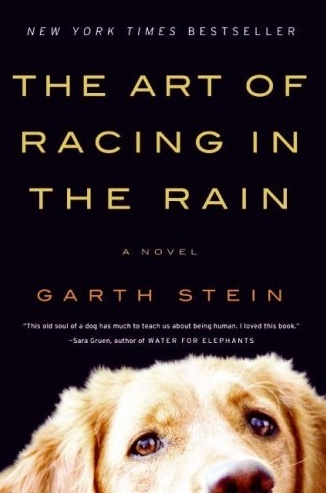 You don't have to be a race fan or a dog lover to read this book, it's just a great story! That is so sad about your dog! He was so adorable! I hope you can get another dog one day and have the experience you're looking for. I hear ya' about not being a dog person. All the pets we have had have been cats and a few fish but, hey, that's another story. This being said, I loved The Art of Racing in the Rain. Enzo's death actually had me shedding some tears, it was so emotional. Teriffic book! Great review! What a good review! I had no idea the book involved racing. I was tempted to get this book, but I don't think I could take it when the dog dies. Thanks for sharing your story and beautiful picture! Ti, what a heartfelt review-very good! I think this book would be way too hard for me to read. I did try listening to it at one time but got discouraged by the racing stuff. Mobley was sure adorable. I agree with your comment about wishing the author talked a little less about racing, but I don't regret reading the book at ALL! It was completely worth it. Besides, my husband is into racing so I could relate a bit. I'm just curious…why is everyone afraid they'll cry if they read a certain book? Am I the only one who loves to feel moved by writing? Marley and Me was waaaay more tear-provoking than this book. Don't you agree? Great review. I am only 30 pages shy of finishing this book but I just ADORE it!! So glad you enjoyed it too! This sounds so intriguing … I love a book told from a dog's point of view. I once read a short story by Dave Eggers that was told from the point of view of the dog and it was so well done — I felt like I was the dog while reading it. I think it is hard enough to write a human character — let alone another' species. And I just love the title!!! I'll have to put it on my TBR list. Lynne,I agree. This book was not sad at all. I felt that it was a celebration of life and what was yet to come. I have this in my "to-be-read SOON" stack and am really looking forward to it, hopefully before the end of the summer. I do think that a cat person can become a dog person. I grew up with cats, and was intimidated by dogs for years, but I became a dog lover in my early thirties. I think some people just like having pets, and some don't. I'm sorry about Mobley – what a cutie! I did get a little tired of all the racing talk but I know why Stein used it. I forgot after a while that Enzo, as narrator, was a dog. The story itself is so sad and it might have been almost too much to handle if told in any other way. This book really has stayed with me. Your dog is very cute! Great review! This was my favorite book of last year! I think I could read this book over and over. I've heard such great things about this book. I am glad you enjoyed it, Ti. I was raised with dogs and have always been a dog person. I never imagined I'd ever have cats of my own. Now I cannot imagine life without cats. I've been fortunate that my dog and cats get along very well and it's worked out. I checked this one out from the library but didn't get around to it. I am a huge dog person. Needless to say this one is on my list. Great review. And I like the doggie pic at the end. Great review. So glad you liked it. I won a copy from Book Club Girl too and will be listening in on Tuesday as well. I better get reading. wonderful review…I would love to read this book. Thanks for the review.